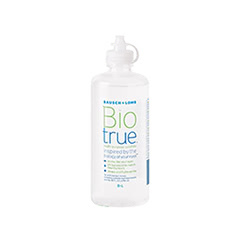 Biotrue solutions contain a natural lubricant found in the human eye. This means they are formulated to work with the biology of your eyes to provide enhanced comfort. These solutions help to remove impurities that may otherwise make wearing contact lenses uncomfortable. 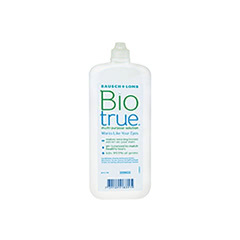 Biotrue can be used to clean contact lenses after each use, and also for storage. As well as keeping your eyes hydrated, these solutions keep them disinfected by mimicking the anti-microbial properties found within natural proteins in the eye. 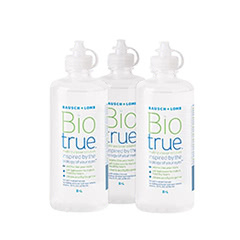 Biotrue contact lens solution is developed by Bausch & Lomb, a long-time global leader in scientific eye research that has marketed many trusted eye-care products. 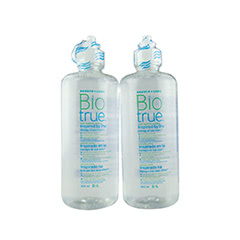 Buy your Biotrue contact lens solution from Lenstore.co.uk for super fast delivery straight to your door. We have options for next day delivery in the UK, or even same day if you’re living in London.